Soon after announcing to shut down its operations, CoinDelta, abruptly increased the withdrawal fees by 3–5x on all crypto assets stored on their exchange. This shut down was announced just after the supreme court of India delayed the hearing of the crypto case. This delay gave skeptics the pivotal opportunity to combine effort and discredit the value of cryptocurrency assets. While Crypto market is seemingly recovering from the bears of 2018 with Bitcoin and other leading cryptocurrencies such as Ethereum and Ripple are apparently seeing the spring after a year-long crypto winter. During this crypto spring, CoinDCX intends to rejuvenate the trust and trading experience for the crypto traders in India also re-assure its own users, that CoinDCX will never harbor such ill practices to address the crypto traders rage on social media. CoinDCX response to the rage! CoinDCX, India’s largest crypto exchange, condemned this exit strategy consorted by CoinDelta and have scaled down the trading fee on all crypto assets significantly, to enhance and restore the user confidence in crypto space. 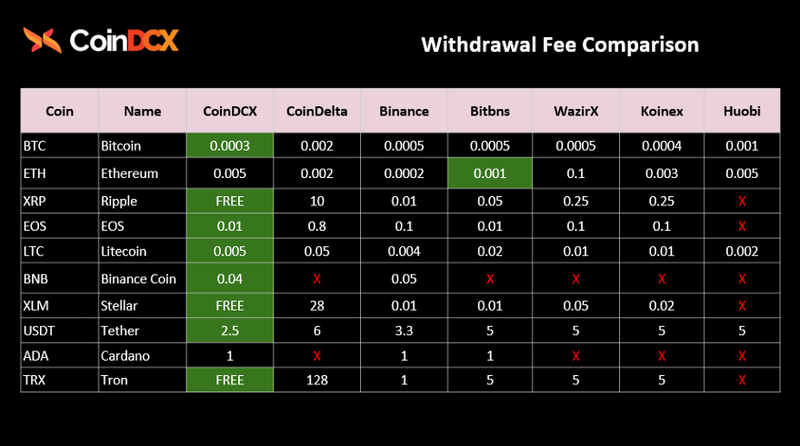 Since XRP, XLM and TRX are the most favored coins in India, CoinDCX announces absolutely 0 XRP, 0 XLM and 0 TRX withdrawal fees, for the whole next quarter! Sumit Gupta, CEO of CoinDCX states that the cryptocurrencies are still in the nascent phase and having more of equitable currencies floating in the market empowers the economies of developing nations like India. He further explained, cryptocurrencies have come a long way since their evolution and the Indian market is just starting to realize the potential associated with the adoption of cryptocurrencies while captivating on them has not yet been thought of. The Indian government has been harping on the importance of security and accountability issues in the crypto market while the regulatory bodies, on the other hand, have been following a sluggish approach in designing the regulatory framework for Indian crypto market. CoinDCX understands the need for an imminent increase in market surveillance which is why the exchange chooses to operate with sheer transparency to build trust among the fraternity. “The ability to truly go the extra mile and cater to the crypto community in these tough times is something that we are proud of at CoinDCX”! Although the crypto space is still unregulated in India, investor protection is of paramount importance. Backed by distinguished venture capital firm Bain Capital Ventures and angel investors including Sanjay Mehta (Mehta Ventures), Sung Ho Choi (Founder, Fubo TV), Karn Nagpal (Blockchain Investor), Jatin Aneja, (Partner at India’s Leading Law Firm), Rafael Ugolini (Blockchain Investor) and Utsav Somani (Partner, AngelList India), CoinDCX is just getting started in crypto space. The birth of Bitcoin, the very first cryptocurrency was the direct result of Satoshi Nakamoto losing trust in the traditional centralized banking system and fiat currency after the outbreak of the financial crisis in 2008. The irony is that the cryptocurrencies started off with a goal to solve trust issues in the financial ecosystem, have now fallen prey to the same! CoinDCX with its strong backing is spearheading its way in crypto space, launching a new platform DCX Lend to solve the liquidity issues in the space. Although what makes it interesting is that the DCX Lend’s dashboard gives the complete picture on lending stats to enhance the trust among the users. The most difficult thing is the decision to act, the rest is merely tenacity! Thought Leader in crypto space. Contributor at Hackernoon, Data Driven Investor and CryptocurrencyHub | International Business Development graduate | Most viewed Crypto Columnist on Quora.